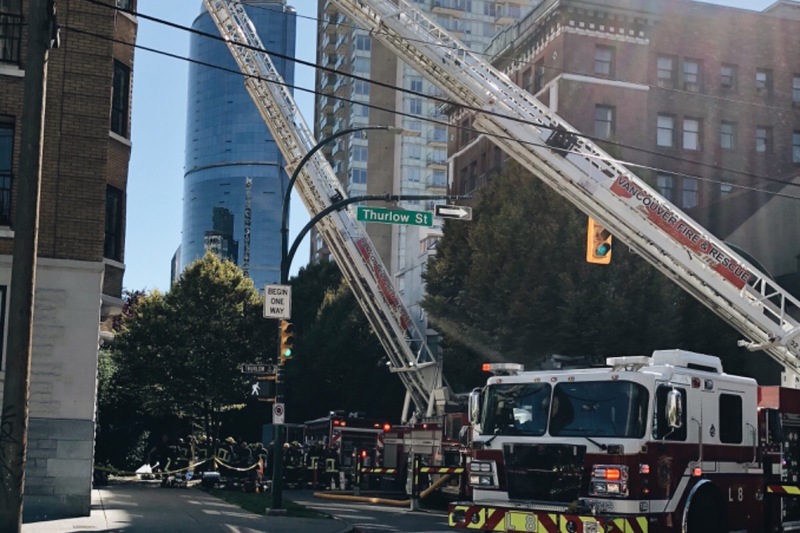 On Thursday October 4th, 2018, a fire badly damaged the Washington Court Apartments at 998 Thurlow Street in Vancouver, BC. The entire building was deemed uninhabitable and all 80 + residents, many of whom lost everything in the fire, have been left homeless. For many tenants, replacing household items, paying for moving/storage/interim housing, and finding alternative housing in the current Vancouver rental market has proven financially devastating. Washington Court was more than just an apartment building in the downtown, it was a community. It was home. The Thurlow Street Relief Committee (TSRC) will be raising funds through this Go Fund Me account until November 15th, 2018*. The Thurlow Street Relief Committee has set up a TD Canada Trust personal savings account for the sole purpose of this campaign. All account activity requires joint authorization from both Alexis Maledy and committee member Mark Bickford. In order to withdraw funds for distribution, both Alexis Maledy and Mark Bickford must be in attendance. Former tenants who were without rental insurance at the time of the fire on October 4th, 2018 have been directed to request assistance from the fund by emailing thurlowstreetfirerelief@gmail.com. The total funds raised through this campaign by November 30th, 2018 will be evenly distributed to all tenants that have requested support via personalized bank drafts. This one-time emergency sum made possible through this GoFundMe campaign will be distributed in-person only between December 12-21, 2018. Beneficiaries will be contacted individually by Alexis Maledy, on behalf of the TSRC, to arrange pick-up. Your generosity will go towards helping families, seniors, and individuals who have lost everything rebuild their lives. *UPDATE: Due to an administration issue, the fundraising period has been extended to November 30th, 2018. NOTICE: The Thurlow Street Relief Committee (TSRC) is an informal temporary action committee that has been self-organized by former Thurlow tenants who wish to help their former neighbors. The TSRC are not professional fund raisers and the TSRC is not legally incorporated. The TSRC accepts NO LIABILITY as a result of its actions acting as Good Samaritans. 1. Assist neighbors who have self-identified as needing help by raising and disbursing funds. 2. Treat all Information gathered through this activity as private and confidential. Share no information with any other party or individual without explicit consent. Treat information gathered through this activity as private and confidential. Share no personally identifiable information with any other party or individual without explicit consent of the provider of such information. 3. Ensure transparency and record keeping in good faith with regard to any information that is not personally identifiable information. 4. Keep processes for decision making simple and easy to understand. 5. Only keep the TSRC active for as long as needed in order to assist neighbors. 6. Destroy all information collected once the committee is closed.